ESOUI » Site Forums » News » Minion 3.0 is here! Our Minions are continuing to grow up! We’ve managed to break them of some of their bad habits (bugs) and done some more training (added features). Now they can take even better care of managing your addons for you so you can concentrate on the business of playing your game! As always when teaching them new tricks it is possible that they might come up with some new bad habits (bugs). If that happens we want you to tell us about it so we can break them of those bad habits. Please see this thread to get the information on what we need when you submit a bug report. You can go here to get your better trained Minion. Please use this forum to provide feedback and receive support. *Minion: A free, eager-to-please little monster lackey of your own, with enough sense to stick to orders! Minion can handle all the 'work' assigned, letting you get back to the 'serious business' of playing your game sooner. 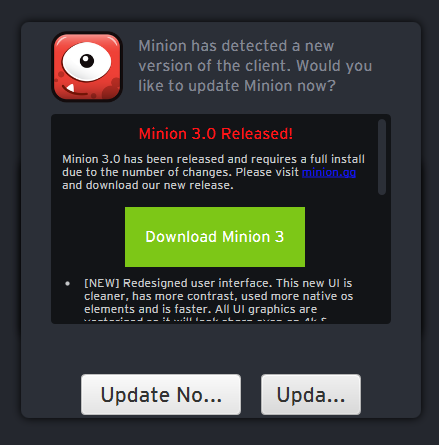 [Note]: If you already have Minion 2.1.x, you will need to re-download and re-install Minion to get the updated version. Last edited by Cairenn : 05/28/16 at 06:50 AM. Last edited by Cairenn : 05/27/16 at 05:03 PM. I will download and install it manually. This is just for your information. One suggestion though: could you please add a dark theme to it? The white skin is really hurting my eyes"
Please add an option for the old skin ( dark ), it also hurts my eyes. Thanks again for A GREAT addon manager. You may have missed one reference. It still suggest "ZAM Network LLC" for the start menu folder in the Win64 installer. EDIT: btw. the old bug where it won't open the changelog window when I click on the version number is still there. I had 3 addons to update in the list. When I click the version number on the next one in the list it doesn't show up and I have to click the title of the addon and then changelog. Last edited by sirinsidiator : 05/28/16 at 05:46 AM. Not shure what I shoud do update no... or upda... ?! Cause when I klick the left nothing happens and the window just pops up again, the right just opens minion normal. Guess I just do a fresh reinstall. Last edited by Tonyleila : 05/28/16 at 06:44 AM. Sorry, yeah minion 3 requires a re-install due to the number of changes. It would have taken way to long to update minion 2.1 to be able to upgrade to minion 3. Due to the amount of feedback we are going to add a dark theme option. Hopefully in the next update if we don't hit any roadblocks. It only does that if you don't uninstall Minion first. Thanks, I for some reason can not reproduce this. I had 6 addons needing update. I click on the version numbers on the first one, click update the changelog window that pops up, close the change log window and click the next version numbers and I get the change log window just fine. Does it matter what AddOns are needing an update? Last edited by Dolby : 05/28/16 at 07:16 AM. I am not sure. I will write down which addons I update if it happens again. On another note, maybe you can add a feature to ignore updates for all addons from myself once the login system works again? At the moment I have to put each new addon on the ignore list manually. Not a huge problem, but it would be nice to have. We currently have a feature in the backlog to auto ignore updates for addons that have a .git or .svn folder. We will probably make it a setting to enable. Would that work for you? I am not using my live folder as working directory but instead copy the files over with a build script. I guess I could let it generate such a folder. So it should be okay. Good update, but... the white... it burns....! Congratulations on releasing Minion 3.0. It's an indispensable piece of add on management software that I rely on for ESO. Having said that... please give us the option to choose a light or dark theme? As someone with sensitive eyes, the glaring white is brutal on my vision. The previous dark tone was terrific, and while I understand some may like the new white, some of us actually rely on the dimmer brightness of the previous theme. Please reconsider. Sounds dumb, maybe, but Minion hurts my eyes with its pure whiteness. [...]Due to the amount of feedback we are going to add a dark theme option. Hopefully in the next update if we don't hit any roadblocks. It seems my virus scanner has other thoughts about minion3. Will leave it for now. Woud be nice to disable the adds/tracking whatever for addon authors. Thank you for the link Tony. We don't have a global auth server at the moment. I think to respond quickly enough we will have to make the 'hide advertisements' button persistent for now. Looks like Norton fixed it already. Every other website is providing high speed downloads. And I'm not able to reach the https://cdn.mmoui.com/ website anymore. Are you having some trouble over there or is it my line/virus scanner what ever?